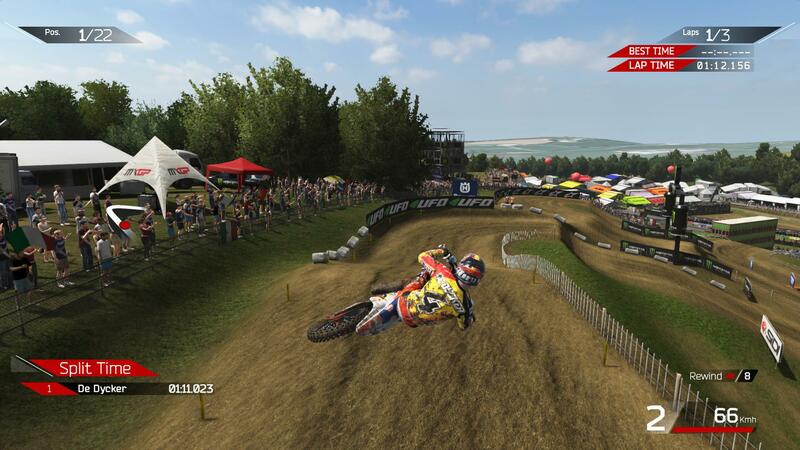 MXGP2 – The Official Motocross Videogame is the latest addition into the MXGP series. Just like the previous game, it’s licensed under an official FIM Motocorss World Championship, this time being the license of the 2015 World Championship. Represent your country, start from the bottom and work your way to the top, take part in real events or battle it out online against other players, your pick! In MXGP2 career mode, there isn’t really a real story. You just enter the career mode, start from the bottom of the ladder with a crappy sponsor and get to the top spot with a very good bike and sponsor. You do get a personal coach assigned to you, but he simply gives you some game tips which doesn’t really give any story value. In the rest of the game there isn’t any story to be found either. However, this isn’t really that big of a deal since MXGP2 is a simulator, not a story-driven game. Graphics wise, MXGP2 is fairly good overall. It’s not the most realistic looking racing sim like Dirt Rally, but it does fairly well and looks pretty convincing. The drivers and the bikes look very detailed and realistic, but the track and its background could use a little bit of work. However, even though the graphics aren’t the best, the game still doesn’t run very well on mid-range PC’s. Quite a bit of tweaking is necessary in order to get it to run at 60 FPS, which can be quite frustrating because the graphic options can’t be found in game because they’re only available in the pre-launch menu. When listening to the sounds, MXGP2 really dropped the ball. Both the music and the sound effects aren’t anything to get excited about. The music is kind of dull and is pretty much just ambient music, most people won’t even pay attention to the race music when it does decide to play at all. The sound effects are even worse sounding, the engines all make the same generic sounds which are just horrible. A lot of the immersion of a simulator comes from realistic sounding vehicles, but realistic sounds aren’t to be found anywhere in-game. MXGP2 is, as you can guess from the name, a motocross racing (semi-)simulator. It’s basically a semi-simulator because it still feels largely arcade-y at times, but this isn’t a bad thing because it’s still fun to play and it’s the style of game people have known and loved since the first game. First of all, this game should definitely be played with a controller. A keyboard is of course also supported, but a controller will give you much better movement and a more natural feeling. Of course you could go all out and use a racing bar with your own clutch and shifter, but most people won’t have the time nor money for that investment. The controls themselves are quite straightforward but do require some getting used to as the bike is pretty sensitive at certain points on the track. The game itself features quite a bit of different game modes. 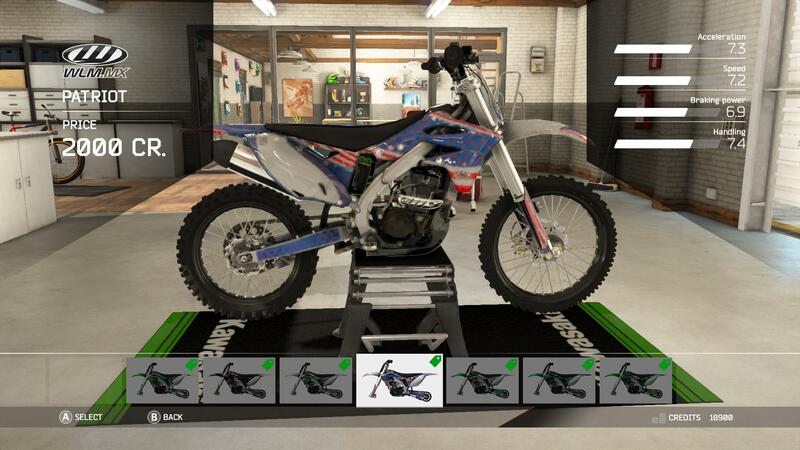 There’s a singleplayer which features MXGP, Career, Monster Energy FIM MXON, Stadium Series and Real Events game modes and a multiplayer. The MXGP game mode is pretty much a standard race with upgraded bikes, giving you the full game experience from the start. 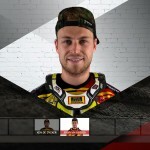 Monster Energy Fim MXON is a new game mode where you represent a country and then perform a series of races with drivers of those countries in order to make your country win. Stadium Series feature a series of indoor races but sadly only have four different tracks and real events are pretty much what you expect them to be. Career is a little bit bigger than the other game modes. It starts you off as a rookie, where you race with small capacity bikes and work your way up to the top both credit wise and reputation wise. The better you do, the more money you’ll get. With this money you can buy new bikes and customize and upgrade your apparel and bike. 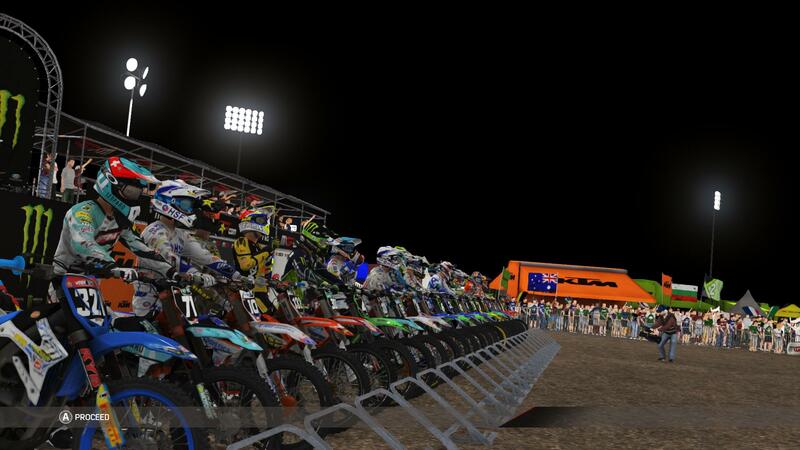 The customization in MXGP2 is actually fairly big. Some items will give you a boost in acceleration while others will boost speed, braking power or handling. Getting new apparel will increase the amount of reputation you get since your rider will be more recognizable. Reputation isn’t just there for show though, it will give you the opportunity to sign contracts with better sponsors that pay more the better you do, so it’s a win-win situation. The biggest annoyance in these single player game modes however is the AI. The AI is pretty much rubbish as they will almost always try to follow the same line even if there are ten riders bunched up with each other. Also, the AI doesn’t seem to fall of their bikes very easily, so trying to overtake while in a corner and getting bumped will throw you off your bike but the AI will simply keep on driving, costing you a lot of seconds. Luckily, the game has rewinds you can use to recover from these events, which are a gift of god as you’ll have to use it quite often in the beginning. It isn’t all that bad though, as the actual racing experience is pretty nice overall. There are a lot of techniques as to how you can race and some are more rewarding than the other, like taking the outside of a turn so you can gain speed on the dirt banks or whipping on jumps to land faster. In the beginning the experience is hard to enjoy because there are so many things to think about, but after doing a couple of test laps, the game is extremely enjoyable even with crappy AI and sounds. MXGP2 was a fairly enjoyable game from start to end. It features quite realistic physics and handling, good graphics and an unexpectedly big amount of customization (which actually does something!). The Career mode is a fun place to start because it starts you off with slower bikes, allowing you to get a feeling of the game. The only downsides are the horrible engine sounds, dumb AI and some limitations to the options menu. Other than that, it’s a very fun game once you get the hang of it.